As recent events raise fundamental questions about educational fairness, thought leaders and supporters united at the Los Angeles City College Foundation Gala to celebrate the institution’s successes in providing students with the financial support they need to attend school, regardless of their ability to pay. The gala and dinner commenced with a musical performance by the legendary multi-Grammy award winning musician Herb Alpert and singer Lani Hall, who brought the jazz spirit of New Orleans to Los Angeles. The hotel’s signature ballroom was embellished with LACC purple and pink from the lighting to the tabletops adorned with floral arrangements and candles. It was the LACC’s largest gala in its 90-year history. Proceeds from the event support students from all walks of life so they can transfer to an accredited four-year university without debt. It also funds scholarships, stipends, book vouchers and other support provided to LACC students. Among the 700 attendees who cheered the award recipients while nibbling on a three-course dinner that included roast chicken and merengue dessert was actress Tiffany Haddish, who presented her mentor Laugh Factory Founder Jamie Masada with the Rodney Respect Award. The award is a product of The Rodney Dangerfield Institute at LACC, which was created in honor of the late comedian. The accolades didn’t stop there. Renowned sports agent Dennis Gilbert and distinguished public affairs and PR leader Harvey Englander accepted individual Outstanding Alumnus Awards for achievements in their respective fields. 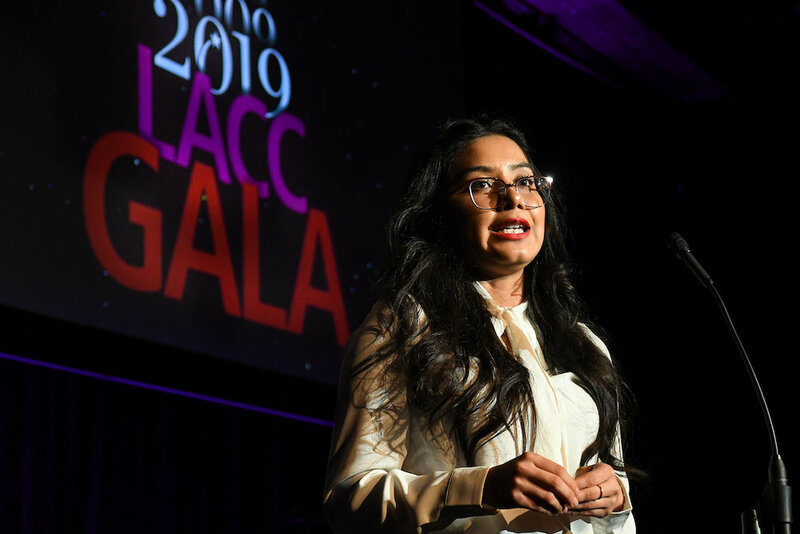 Throughout the evening, LACC students took to the stage to shine a light on their positive experiences and stories as namesakes from LACC scholarships and support. LACC is the flagship institution in the Los Angeles Community College District, the largest community college district in the country. During the past twenty years, the Foundation has provided in excess of $7 million in financial support for students, many of whom come from the most challenging areas of LA County where 65% of the households are living below the poverty level.